Many low- and middle-income governments look to import duties and value-added taxes (VAT) to fund critical government services and the bulk of SHS equipment is produced in China. As sales of systems have grown, the question of how these systems should be treated under border taxation regimes has become a prominent issue. 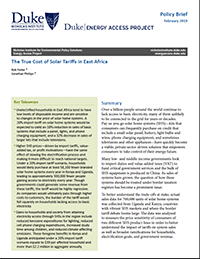 To better understand the trade-offs at stake, actual sales data for 700,000 units of solar home systems was collected from Uganda and Kenya, countries with vibrant SHS markets and where the border tariff debate looms large. The data was analyzed to measure the price sensitivity of consumers of two different SHS product lines in order to better understand the impact of tariffs on system sales as well as broader ramifications for households, electrification goals, and government revenue. More about this project can be found on the Energy Access Project site.